After years, even decades, of being moved around the world to serve in the US military, veterans home loans are a way to help military service members come home. The VA loan program is offered by the Department of Veterans Affairs to help veterans and their families find the mortgage financing they need to be able to buy a home. Of course, we understand if you have questions about how your veterans home loan offer works. The VA’s website doesn’t always have the clearest or easiest to find information available. Start with these questions that many have about VA loans, or contact the Patriot Home Mortgage team for help from an experienced VA-approved lender. A VA loan, similar to an FHA mortgage loan, is not actually a loan directly offered by the Department of Veterans Affairs. The VA loan program is actually a means of guaranteeing loans offered through a variety of different lenders. However, since the Department of Veterans Affairs guarantees a portion of the loan, they can set the rules for qualification and the terms for the loan. It also means that most lenders are willing to provide loans to borrowers they might otherwise deny, as long as the borrower meets the VA loan requirements. With veterans home loans, lenders will loan up to 100 percent of the value of the home — meaning no down payment is required — assuming the borrower meets the other eligibility criteria. How many VA loans can I use? Generally, you may only use one VA loan at a time. However, you may be able to use a veterans home loan to purchase a second home if the first loan has been paid off — paid off meaning the full amount of the loan has been paid through either monthly payments or money from selling the home. If you have paid off your first VA home loan and you still own the home, you can apply to have your previously-used entitlement “restored” to purchase a second home, though this is a one-time-only option and is generally only allowed for active duty service members who are PCSing and want to keep their current home for retirement. If your veterans home loan is paid off and you no longer own the home, you can have your entitlement restored multiple times. Veterans home loans can be used to purchase a second home while the first is still owned and not yet paid off, but that will depend on the amount of your entitlement. Work with a VA-approved lender to learn more about this process for your specific situation. Why are veterans home loans better? The biggest perk of veterans home loans is that they allow you to take out a loan and purchase a home without a down payment. Of course, if you have a down payment, it will help your monthly payments, but it’s not a requirement. The VA home loan also guarantees loans for those with lower credit scores, who might not be eligible for a loan or who would have a high interest rate otherwise. And, because the loan is guaranteed in part by the Department of Veterans Affairs, the mortgage insurance requirement for down payments below the accepted limit is waived for those who are eligible for veterans home loans. What is the service requirement for eligibility? Service requirements depend, in part, on when you served. First, all eligible veterans have to have separated other than dishonorably. The general requirement is 24 months of active-duty service, though that drops down to 90 days of active-duty service for those who served during war times. For those discharged other than dishonorably with a service-related disability, you may be eligible even if you don’t meet the minimum time requirement. Spouses of eligible veterans are also eligible to use veterans home loans as long as you are unmarried and your spouse died in service or from a service-connected disability. In addition, active duty personnel are eligible to use their veterans home loan benefits before separating, after you have reached the minimum service time requirement. Ultimately, you will need a Certificate of Eligibility from the Department of Veterans Affairs to complete any veterans home loans applications, but you can check with a VA-approved lender to see if you may be eligible. Do VA home loan benefits expire? No, if you are eligible for veterans home loan benefits, you will retain that eligibility. The entitlement will remain good until used if you are active duty. After you separate, your eligibility will be determined again based on your time of service and type of discharge. What about second or income properties? Using veterans home loans for second homes, vacation homes, or rental properties is a bit more complicated. According to Military.com, “The law requires that you certify that you intend to occupy the property as your home. But it specifically provides that occupancy by the veteran’s spouse satisfies the personal occupancy requirement.” Your VA home loan can be used for a variety of purposes including things like renovations or repairs, buying and building on a manufactured home lot, and even adding solar heating or cooling. You are also allowed to buy an income property with up to four units, with the proviso that you live in one of those four units. Want to learn more about the benefits veterans home loans have to offer? 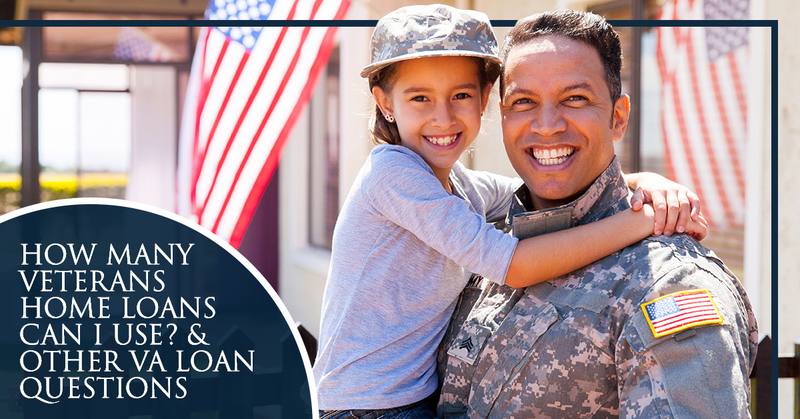 Contact the VA-approved lending team at Patriot Home Mortgage to learn more and get started today!